We've featured postcards of this corner before, but in this one you can see more of the buildings north of the intersection. 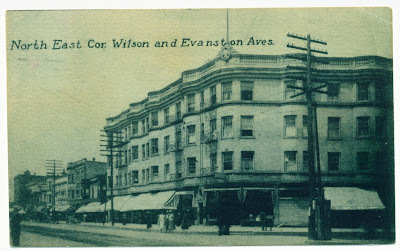 Evanston Avenue was renamed Broadway in 1914. Image courtesy Compass Rose Cultural Crossroads. That is one amazing photo! And to think what replaced that beautiful building. I know... I can't get enough of this building, and am always thrilled when I am able to acquire new images of it.